Rhino Shelters – Batten down the hatches this winter. Click here to see all Rhino Shelters in our online Store. Rhino Shelters – Batten down the hatches this winter with a Rhino Shelter and protect your precious items from the elements. When it comes to a fast and economical storage solution, Rhino Shelters are the best invention since the slice pan. Although they come in a wide range of sizes to suit any situation, from all types of auto storage to livestock shelters, in this article we will look at our 3 most popular Rhino Shelter sizes. 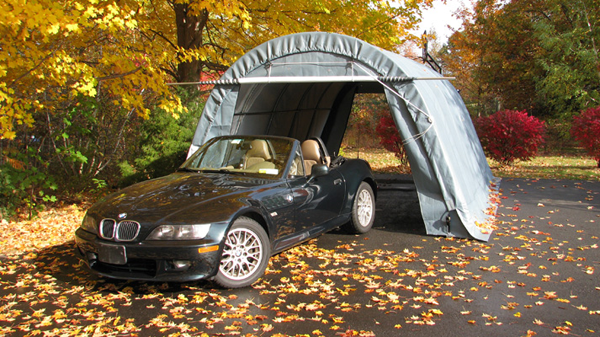 12x20x8 Rhino Shelter or One Car Garage as it is sometimes called, also available in 24ft long. This size of shelter like many Rhino models is available in two different styles. Round Top Shelter and House Style Shelter. What’s the difference you ask? Well simple really, the round top as its name suggests has a curved roof which makes it very popular in high snow areas as snow is less likely to build up and put extra stress on the structure over the winter months. The House Style Shelter on the other hand has straight walls and an apex style roof just like a traditional house. Although it is not as popular in high snow areas it does offer more cubic space inside as it has straight walls and a high pitched roof. So, depending on what your needs are, these are some things to consider. If you are just storing an auto for the winter then a round top could be just the thing. On the other hand if you plan spending a lot of time in there working on your hobby then the house style would offer more space to move around. 22x24x12 Rhino Shelter or Two Car Garage. At over 500 sq ft of floor space the two car garage is more of a house style design but is still curved at the eves which would help to release snow build up to a certain extend. It is 12ft high at the apex which offers great head height on the inside making it suitable for a whole range of uses from workshops, garages to hobby space or even an outdoor gym room. Access it maximized by 2 full width, full height zipper roll up doors and you will easily fit two autos side by side with abundance of space. 30x30x15 Three Car Round Top Shelter. 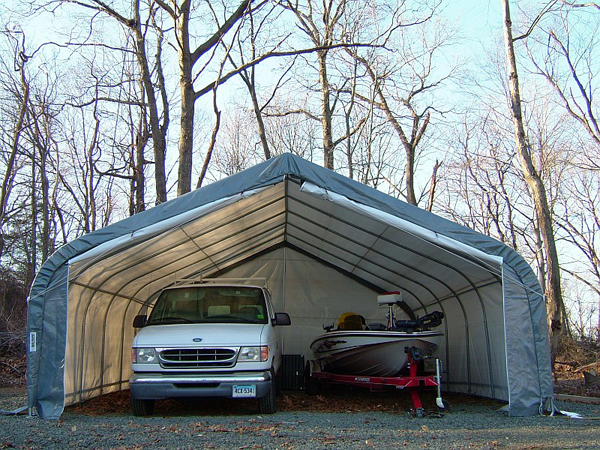 As its name suggest the 30x30x15 has a complete round top roof making it the perfect shelter for a high snow area. It has some c.900 sq ft of floor space making it ideal for multi auto storage or as a large workshop space. 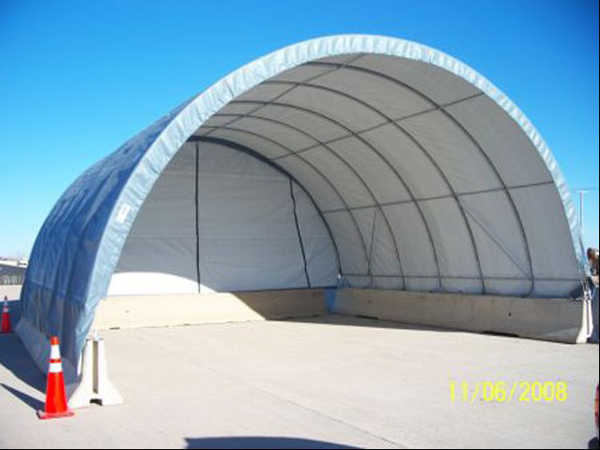 Its dome like construction make this shelter surprisingly rigid and strong and when properly anchored it will withstand extremes of weather. A cool thing is it has full height zipper doors front and back which can be handy for auto access either side. This entry was posted in Shed Articles on October 9, 2013 by gorman101.